Learning can fuel the community’s work in maximizing its appeal to the “next” generation, often described as being “Live First, Work Second” in orientation. Because this is a dynamic process and because a community is always a work in progress, educational institutions have an amazing opportunity to inform and facilitate continuous improvement right there, in their own back yards. Books written by Florida (2002) and Ryan (2007) provide advice for those seeking to design a “next” community, attractive to the “next” generation. Together they have identified a list of nine indices or characteristics that are critical design components sought after by the next (creative class) generation when choosing a place to live. Learning plays an important role in realizing each component. Educational institutions, preK-16 through graduate school, public and private, traditional and non-traditional, can serve as a vehicle to facilitate the successful implementation of each design component. This community is graced by a number and variety of educational institutions: independent school districts, charter schools, private schools, Montessori, workforce, Central Texas College, Temple College, University of Mary-Hardin Baylor, and Texas A&M-Central Texas. Vitality / Lifestyle—The next generation wants to be tourists in their own city. Educational institutions provide the organization as well as the physical facilities for participation in recreational activities, sports, and cultural events. They also provide information and motivation to the community regarding the importance of creating and nurturing green spaces. Earning / Thick Labor Markets—The next generation wants varied employment opportunities. The quality of public schools is a strong attractor when families are choosing the community they want to call home; it is also an important factor when recruiting new businesses. Workforce employment centers offer just-in-time training and retraining. Higher educational institutions spawn new business opportunities and attract businesses to the area to take advantage of the talent found at the colleges and universities. Jobs in the field of education may provide additional employment opportunities for the creative class as full time teachers/administrators or part-time adjuncts or volunteers. The university can use research and development grants to fund inventions and patents, transfer their research results into industry, and spin-off its work into start-up companies. From a very pragmatic perspective, having a university in the area can increase the average annual earnings in a significant manner, especially in regions having fewer than 200,000 jobs. Making this kind of impact is already within our reach. Texas A&M, College Station, our parent university, ranks second for overall research and development per capita among communities having a population fewer than 250,000. (See Endnote 1) This commercial function of the university can fuel a creative economy through ideas that pay. Learning—The next generation seeks education, continuing education, and re-education. Quality education for their children is a high priority for the next generation. I know of a family with several small children who chose their place to live on this criterion. The father is a successful patent attorney who could practice his profession anywhere in the world. When deciding the best way to educate their young family they preferred to have them educated in public schools. After considerable research, they chose Southlake, Carroll, as the place they would move—to take advantage of the educational system there. He then found a job in the area, and they moved there. The state of Texas has embarked on a journey to create a college-going culture and provide life- long learning opportunities, PreK-16, that will be very attractive to the next generation. Central Texas is at the epicenter of that journey. 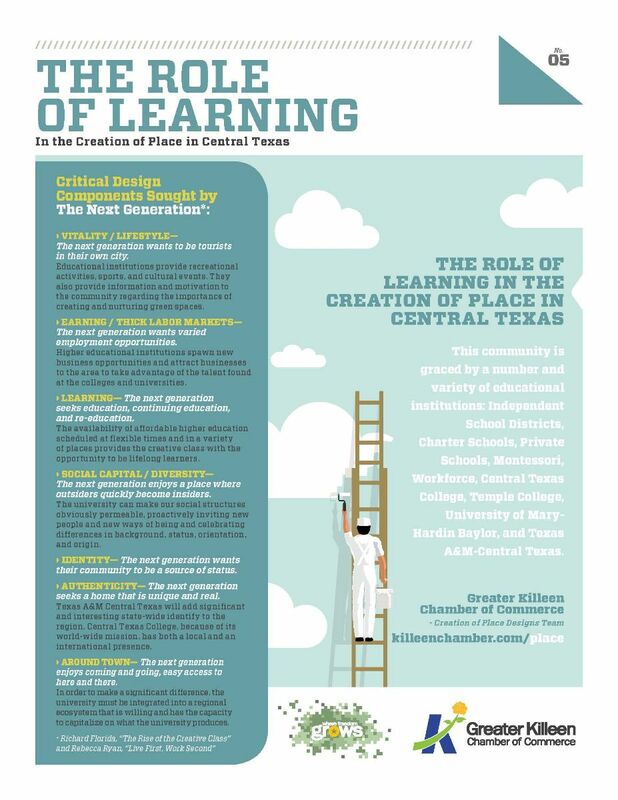 Central Texas College, in collaboration with local public school districts, Temple College, Texas A&M-Central Texas, and the workforce Board, has lead the way in designing a strategic action plan that will crate that college-gong culture. Significant actions of that work include e a 2+2+2 College Connection Grant and summer camps for public school students. This college-going culture can “significantly shape our community’s handprint, drawing the next generation to us. The Workforce Board, one of the best in the nation, specializes in re-education in a variety of format and addressing a variety of skills. Social Capital / Diversity—The next generation enjoys a place where outsiders quickly become insiders. The university can attract faculty, researchers, and students that will fill the talent pool, both qualitatively and quantitatively. Collaterally the university can encourage highly educated and talented people and firms to locate nearby. Years ago, Robert Lucas, Novel prize-winning economist, established the fact that “Economic growth stems from clusters of talented people and high human capital.” (See Endnote 3.) The university can function as an education entrepreneur, fueling a creative economy by generating, attracting, and mobilizing talent. The university can teach and model the importance of diversity, as well as attract diverse populations. It can make our social structures obviously permeable, proactively inviting new people and new ways of being and celebrating differences in background, status, orientation, and origin. In this manner the university can host a stimulating environment that fuels a creative class through self-expression, new ideas, even eccentricity. The university can provide a lifelong learning system that fosters diversity in learning style, changing the question we have been asking, “How smart are you?” into “How are you smart?” Seeing students through this second lens is a powerful attractor to the right- brain, creative learner. This learning system can model and promulgate collaboration, maximizing the impact of differences. Through its infrastructure, the university can produce a “brain gain," serving as the Elli Island of the creative age. Interestingly, the mother of the family that moved to Southlake to take advantage of the educational system for their children, stated that the new area provided everything they had hoped, from academics and athletics to extra curricular activities. She was not entirely satisfied, however. The one thing she missed was the diversity of their previous home in Washington D.C.
Identity—The next generation wants their community to be a source of status. Texas A&M Central Texas will add significant and interesting state-wide identify to the region. Conversely, because TAMU-CT is in its incubation stage, the community is playing an important role in shaping its identify. It is known for its unique style. The rich biomedical community that ranges from Scott and White in Temple to Darnell at Fort Hood is the proud home of the current American Medical Association president. Central Texas College, because of its world-wide mission, has both a local and an international presence. Public schools are faring very well, as well. Killeen and Ellison High Schools have been recognized in national and state publications as being outstanding high schools. Elementary schools have been designated as Blue Ribbon Schools. Authenticity—The next generation seeks a home that is unique and real. After hours / Social Interaction –The next generation needs a place to just be, to enjoy, to breathe, and to be with friends. The university provides cultural, entertainment, music, sporting events, as well as academic opportunities. It houses libraries, seeking readers and conversationalists. Cost of Lifestyle—The next generation may have limited financial resources. Around Town—The next generation enjoys coming and going, easy access to here and there. Educational organizations can host thoughtful planning sessions where the community creates and re-creates this sense of space, where the community is both the classroom, teacher, and learner. Educational institutions can serve as powerful creative hubs in the handprint of a community. In particular, Texas A&M-Central Texas can comprise a powerful hub in regional development. Acting along, educational institutions are necessary, but not sufficient. They can be a catalyst, but not the lone actor. In order to make a significant difference, the university must be integrated into a regional ecosystem that is willing and has the capacity to capitalize on what the university produces. In order to gain the competitive advantage, we must build and maintain connective tissue between the university and the regional ecosystem. Harvey Goldstein and Joshua Drucker, “The Economic Impacts of Universities on Regions: Do Size and Distance Matter?”, Economic Development Quarterly, 20, 1., (2006), pp. 22-43. Robert Lucas, “The Mechanics of Economic Development” Journal of Monetary Economics, 22, (1988), pp. 3-42.